Presently the Church in the United States humbly boasts of 14 saints, seven Blesseds, 17 Venerables (whose heroic virtue the Church has declared), and 75 servants of God (whose heroic virtue is now being studied). The Church exists to make saints, to continue Jesus' mission to save us and bring us to eternal life. In the final analysis, we either become holy -- in this world or thanks to the merciful cleansing of Purgatory -- or we go to hell. While few of the saved will ever be raised to the altars as examples and intercessors, it is a sign of a properly eschatological focus that the Church actively promotes causes of canonization that show us that sanctity -- the ultimate purpose of our baptism -- is possible in every age and in every state of life. One of the most important signs of maturity, hope and health in the Church in the United States is the number of candidates now being proposed for canonization. On September 23, Fr. Stanley Rother will be beatified in Oklahoma City and on November 18, Fr. Solanus Casey will be beatified in Detroit. Presently the Church in the United States humbly boasts of 14 saints, seven Blesseds, 17 Venerables (whose heroic virtue the Church has declared), and 75 servants of God (whose heroic virtue is now being studied). Among those in the pipeline are Archbishop Fulton J. Sheen, Fathers Michael McGivney, Patrick Peyton, Joseph Muzquiz, John Hardon, Walter Ciszek, Vincent Capodanno, Emil Kapuan, Sr. Rose Hawthorne Lathrop, Dorothy Day, and Cardinal Terence Cooke. One of the most fascinating causes is being promoted by the Diocese of Kansas City St. Joseph, Missouri. It's of someone who has never set foot in the United States: Sr. Marie de Mandat-Grancey (1837-1915), a French religious sister famous for helping to rediscover the ancient house in Ephesus, Turkey, where many scholars and several recent Popes plausibly conclude the Blessed Virgin Mary spent the last years of her life and from which she was assumed into heaven. As a religious, her cause should ordinarily be promoted by the order to which she belonged, the Daughters of Charity, founded in 1633 by St. Vincent de Paul and St. Louise de Marillac. The Vincentians and Daughters, however, choose not to promote their own, permitting the dioceses where their sons and daughters died to do so if they choose. The Archdiocese of Smyrna, Turkey, where Sr. Marie died, has wanted to promote her cause since then-Archbishop Giovanni Zucchetti unofficially canonized her during her 1915 funeral, saying that her "passage to glory does not tolerate any delay," comparing to St. Louise and to the female heroines of Sacred Scripture, and asserting that Christ has already beatified the merciful (Mt 5:7) and promised to call to his Father's kingdom those who have cared for him in the poor and needy (Mt 25:31-46). But two World Wars, persecution of the Church in Turkey, and the lack of financial and canonical resources in the Archdiocese of Smyrna have made it impossible for the Diocese where she died to advance the cause. In such circumstances, it is possible for one Diocese to ask another to take over. That's what the Diocese of Fall River has done in requesting the Archdiocese of Baltimore to take over the cause of Father Peyton and what the Archdiocese of New York has done in asking the Diocese of Peoria to lead the cause for Archbishop Sheen. 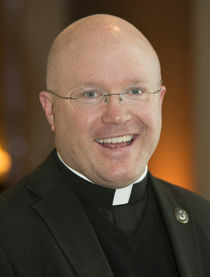 So the Archdiocese of Smyrna, knowing that none of the Dioceses in Turkey were adequately equipped, asked the Diocese of Kansas City St. Joseph if it would be willing officially to assume the promotion. The Missouri Diocese has a rich history of Vincentians and Daughters of Charity, has a new Benedictine Monastery dedicated to imitating Our Lady's hidden life in Ephesus, is the headquarters for The Ephesus Foundation and has some of the leading members of the American Society of Ephesus. Then-Bishop Robert Finn of Kansas City St. Joseph happily agreed and the Diocese has moved the cause forward quite competently and expeditiously. What can Catholics in America and faithful everywhere learn from Sr. Marie? First, she is a tremendous lover and apostle of Mary's divine and ecclesial maternity. In 1831, Mary appeared to St. Catherine Labouré, a Daughter of Charity, with the revelation of the Miraculous Medal and asked that associations of the Children of Mary be formed. When Sr. Marie became a Daughter 26 years later, that's precisely what she did in both France and in Turkey, forming thriving Children of Mary groups in her three assignments to promote the devotion of children to the Mother God the Father chose for his Son and that Son from the Cross chose for us. "Be like Mary," she would say to the ever-growing groups of children. When Sr. Marie read Blessed Anne Catherine Emmerich's revelations on the "Life of the Blessed Virgin Mary," which among other things, included a very detailed description of where Mary's long lost house in Ephesus would be located, she desired out of ardent Marian piety for it to be found. Transferred to Smyrna, she perseveringly lobbied initially skeptical Vincentian priests to take up the hunt. When they succeeded, using Emmerich's revelations almost as a map, Sr. Marie used her family's resources to buy the mountain on which the house was built, funded its rehabilitation, and then oversaw its development as a place of prayer and pilgrimage. Even if one has questions about private revelations or the historical case for Mary's House in Ephesus -- visited by the future John XXIII and Popes Paul VI, John Paul II and Benedict XVI -- there's no question about Sr. Marie's heroic filial love for the Blessed Mother. Second, she is also a model of vocational receptivity and response. She was born to a very wealthy and noble French family that numbered among its ancestors two French popes (Clement VI and Gregory XI) as well as St. Gaul, Blessed Raingarde and, perhaps most famous of all, Peter the Venerable. To set aside her situation of wealth, status and privilege to serve the poorest of her day took a lot of courage, as did overcoming the strong opposition especially from her eldest brother when saying yes to a vocation that meant one might never see one's family again. But she prayed at 13, "Grant me, I implore, my God, a vocation to religious life. Give me the grace, O my God, to completely detach myself from the things here below and to aspire only to heaven." And God heard that prayer. Third, she's a compelling example of heroic Christian charity. 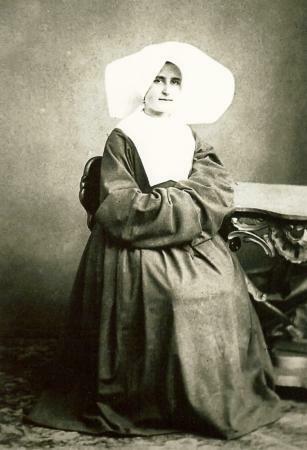 In her first assignment, in Aire-Sur-La-Lys, she cared for 55 orphans, ran a sewing workshop for 60 girls training them for work and life, directed the pharmacy, traveled to neighboring towns to care for the sick, founded the Children of Mary, and showed special love for children with lice and scurvy, overcoming her revulsion to help them heal so that they wouldn't be ostracized from other children. After her transfer to Le Pecq as "Sister Servant" or superior, she directed an orphanage that, because of the brutal Franco-Prussian war, trebled in size, leading her, born noble, to beg shamelessly for food, clothing, beds, medicine, school supplies and for another building to house them all. When huge numbers of new children would arrive -- totally alone after their parents were killed -- she and the other sisters would welcome them first with love, before figuring out where to lodge and how to feed them. She was so successful in her 16 years in helping the orphans find new families and form a culture of loving acceptance that she was able to put the orphanage out of business. The final three decades of her life were spent in Smyrna, Turkey, where she responded to Pope Leo XIII's call for missionaries. She and her fellow Daughters of Charity took over the French Hospital, where she cared for wounded sailors and everyone else, used her family's resources to renovate the institution, established classrooms to provide first sick children and then everyone a basic education and catechism, inaugurated two sewing workshops for the girls, and once again founded an association of the Children of Mary. Throughout her 58 years of religious life, she valiantly and joyfully fulfilled her fourth vow of service, following the example of St. Vincent and St. Louise in serving Christ in the poor. Those wanting to know more about her inspiring life can turn to Fr. Carl Schulte's 2011 biography "The Life of Sr. Marie de Mandat Grancey" or visit www.sistermarie.com, where prayer cards can be downloaded or ordered to pray for miracles and other intentions through her intercession. If her cause succeeds, her beatification would almost certainly take place in Missouri, with celebrations likewise in France and Turkey, the three continents in which there's already devotion to her. That would be a confirmation that she's already with St. Vincent and St. Louise, celebrating eternally in the place to which from Ephesus the Mother she loved was assumed body and soul.